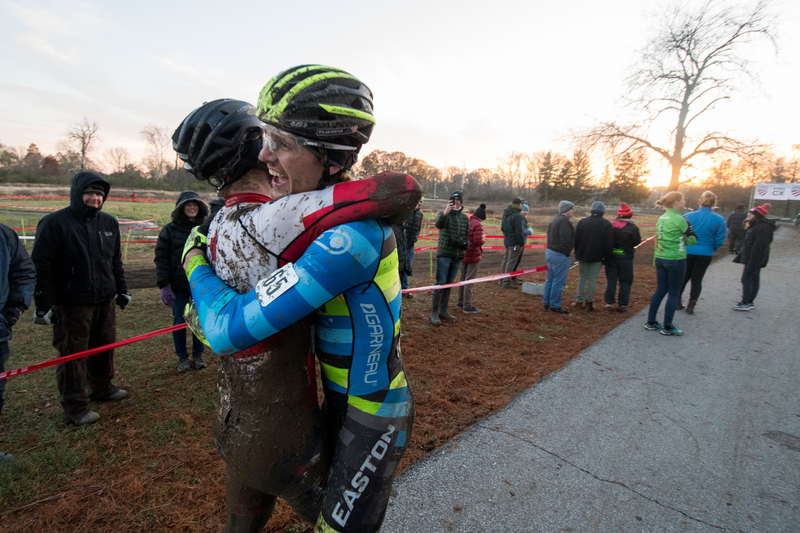 Scenes from the second of two muddy days of UCI C2 and junior mens racing near the Major Taylor Velodrome in Indianapolis, Ind. 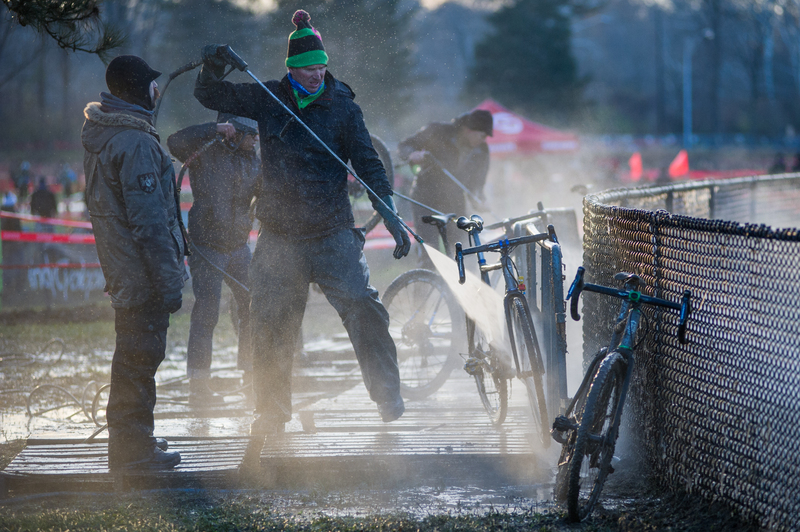 There’s always a mud pit or puddle somewhere near the pits when pressure washers are going nonstop. But this one was crazy because it was very deep and the riders were either splashing through it right before or after they got their new bikes. Given just how wet everybody was after only half a lap, or even after the holeshot, it probably didn’t seem like a big deal to the riders, but it made for some dramatic photos. Jen Malik had a very impressive ride on Sunday. She went down right after the holeshot but managed to gather herself and work her way through the field to end up on the podium. 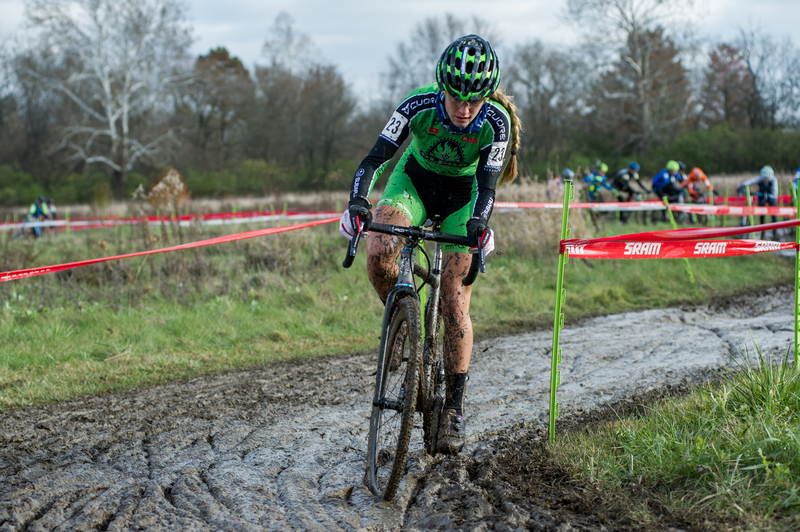 Katie Clouse rode to a repeat second place on Sunday. 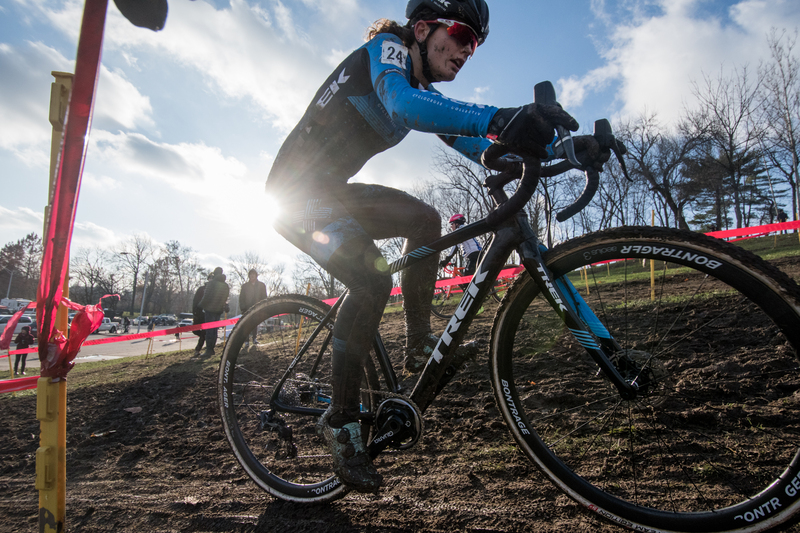 Her Alpha Bicycle Company – Groove Subaru team had a great weekend with Gage Hecht taking the win in the elite mens race on Saturday and a heart-breaking second place on Sunday. 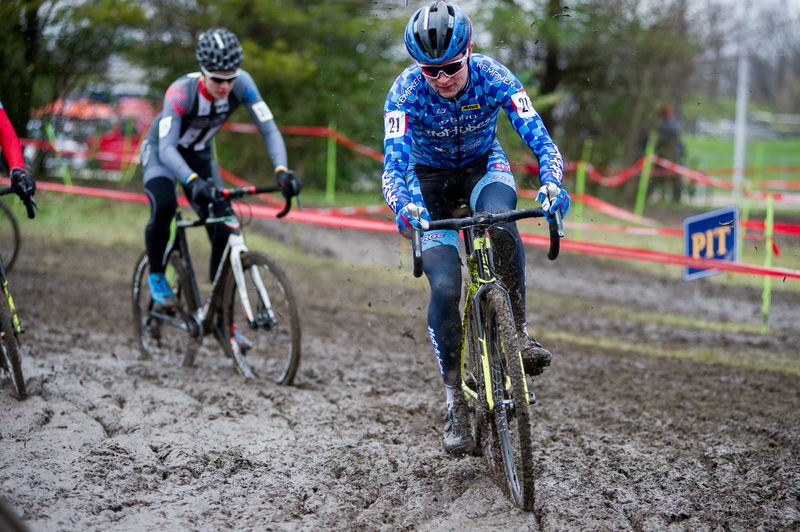 “Despite the inclement weather and threat of actually not getting to race on Saturday, everyone brought their A-game to the startline. It was all-out from the gun. 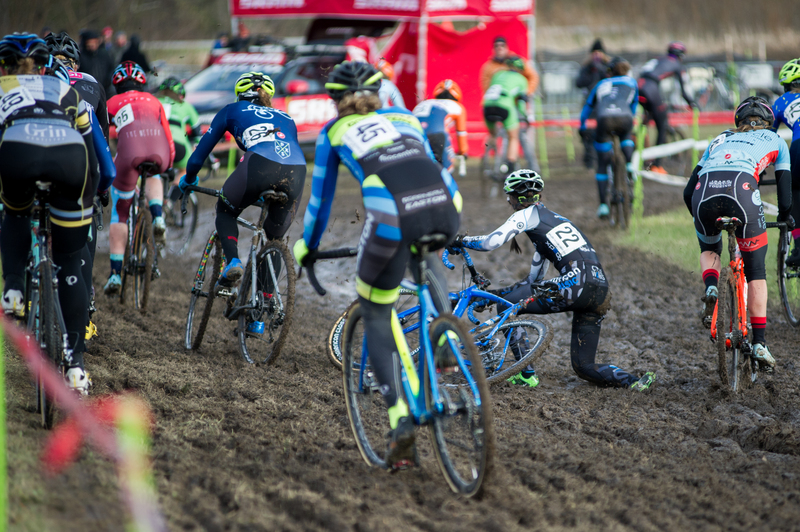 Everyone was fighting tooth and nail for those precious UCI points during the shortened, 30-minute race — especially with the threat of being pulled in order if lightning struck again. I fought back from 14th in the final lap to end up winning a sprint for 11th, a sprint which all three of us thought was for the final UCI point. I was still really happy with my performance and for not giving up; it’s not often I get to run full-speed through ankle-deep mud, remount and sprint on the pavement with two other strong women. “Sunday proved to be even more of a running race, which actually played to my strengths. 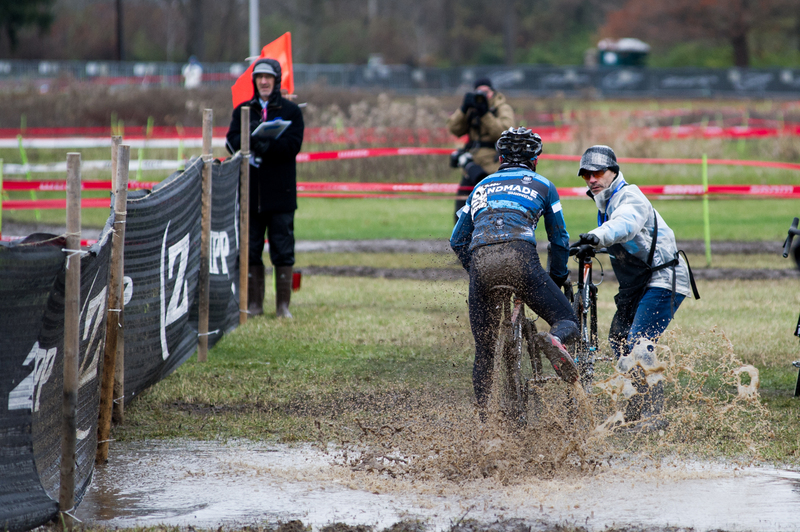 I found myself making up time and passing people as they tried to ride the deep slop. I ran my way into the top 5 on the first half lap! Again, I found myself battling it out for 10th place — and the final UCI point. I was never sure of my exact placing, and positions 8 through 12 seemed to change every lap. Yet I felt confident on the run-up and the descents, and was delighted to end up 10th after Saturday’s disappointing near-miss. 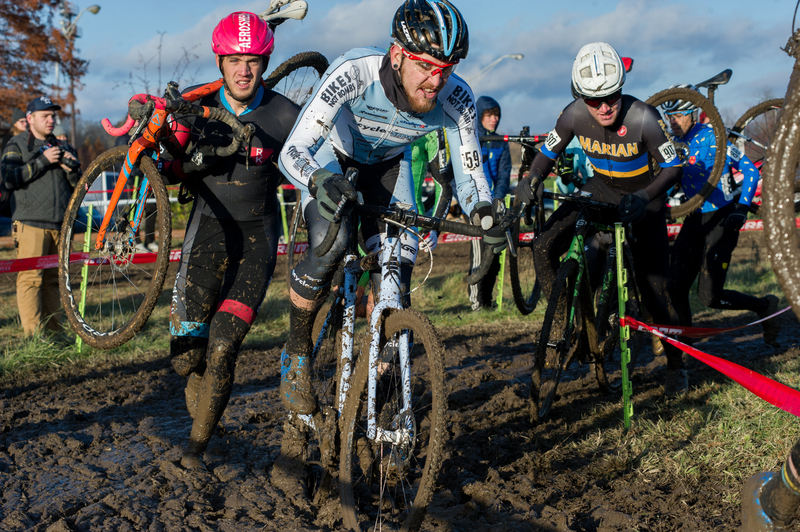 The sun came out on Sunday for the elite races but not nearly in time to dry much out. At the end of the day on Saturday, most riders seemed to be anticipating “peanut butter” conditions for Sunday. The hill had dried out sufficiently to make most of Saturday’s unrideable sections passable, but overall the course mostly seemed wetter, if that is possible. 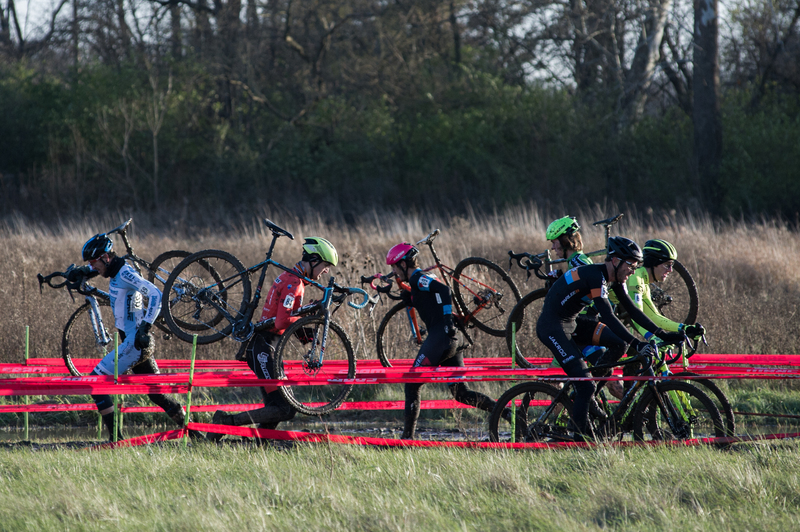 Shortly after the holeshot, this was one of the few spots on the low, flat section of the course that was rideable. 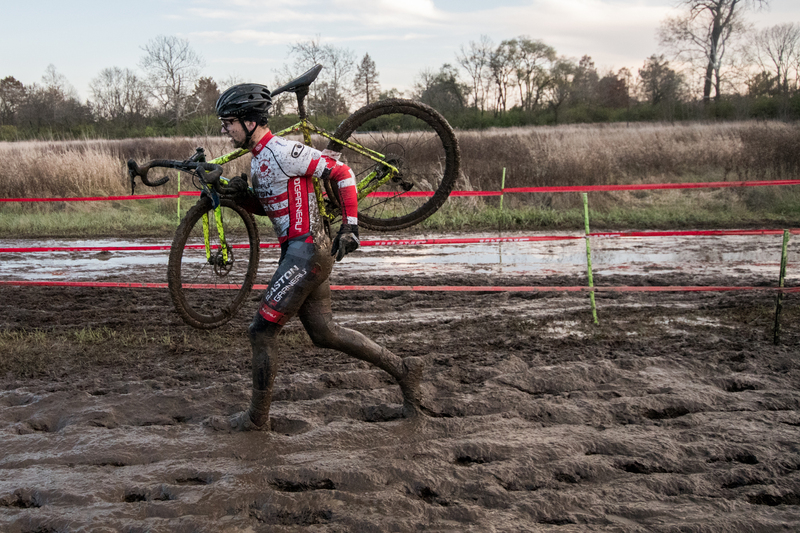 Most of this part of the course was in such a condition that once you dismounted, you were off your bike and running for a long time. “The races this weekend couldn’t have been better. 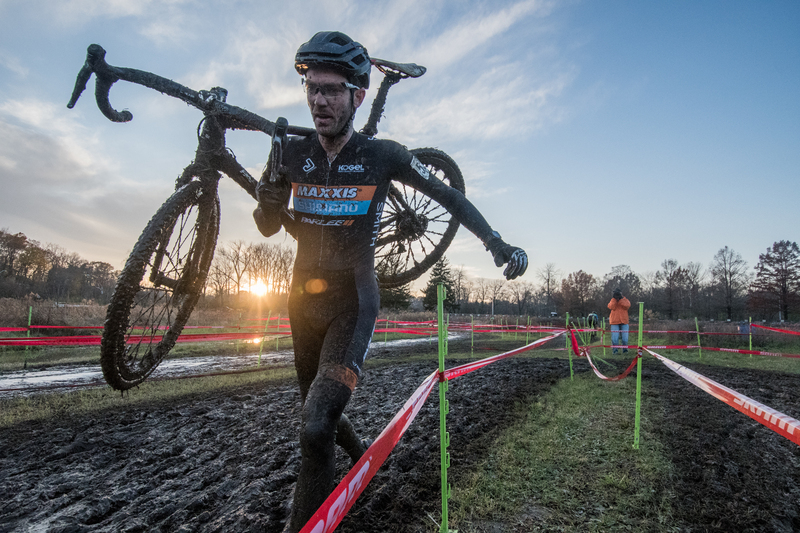 Great courses, great event, and amazing CX weather! I was really looking forward to this weekend because I’ve finally felt like I’ve started to find my groove this year. With three races spread across the country, the competition was bound to be spread a little thin at each with a great opportunity to snag some points (which I am in desperate need of, ha! ), so I wanted to make sure I was on good form. “Anyway, with the start of the first day I honestly didn’t know what to expect. I have had a year full of mechanicals and mishaps, and with a clean start I found myself in the top three. 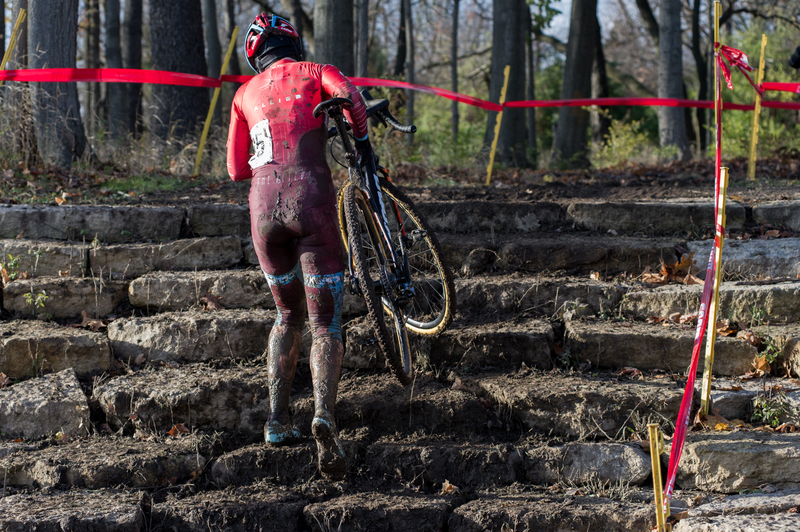 Sometimes I find myself getting a bit too excited for an opportunity like this, but I knew it would be a race of attrition with all of the mud so I made sure to race smart and just keep things upright. As Gage distanced himself from MVDH [Michael van den Ham] and I, we couldn’t help to look to each other for a battle after our attempts to bridge became futile. Going back and forth the whole race I made sure to study a few key sections where I was able to get a few seconds on Michael. 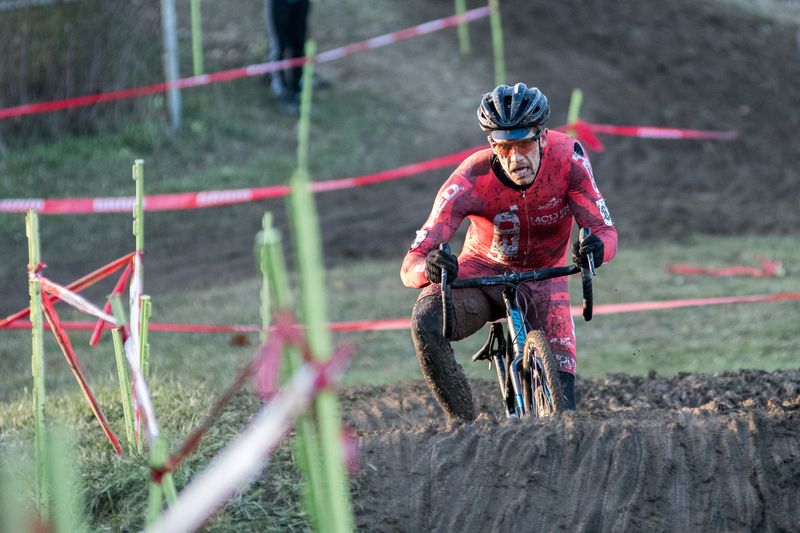 We each had our bobbles and crashes, which made for some great back-and-forth, but as I recovered I was able to plan for the remaining laps in the race. 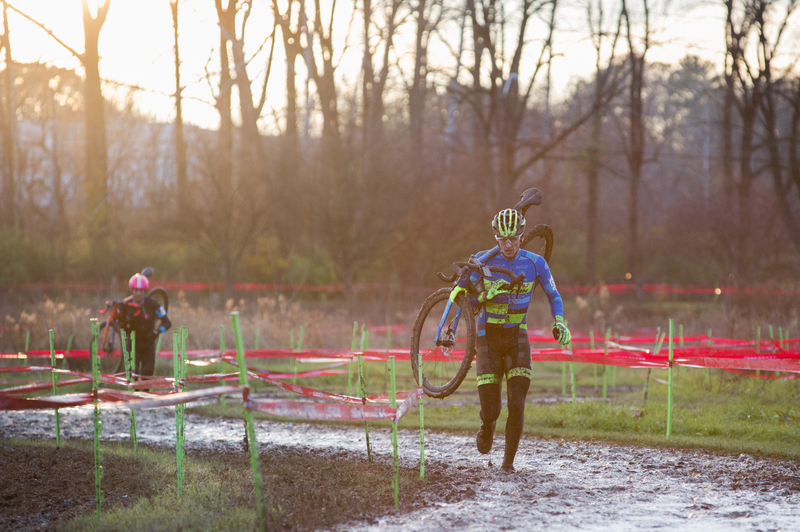 With one to go, I pressed hard on the long off-camber section of the course before pit 2 to gain a few seconds, pitted for a clean bike, then powered thru the bog to secure second place. I was so happy to have as clean of a race as I could’ve had, and to achieve my second-ever UCI podium. “After we left the pavement on the start I was set up to enter the first right turn in 6th or 7th place. For some reason the inside of the corner was open so I cut hard, passing two or three, and found myself trudging behind [Drew] Dillman in 4th place. Late in the first lap the lead three established themselves with many punchy top-end efforts, something I did not have that day. I watched them float away, and with a small gap behind, my only strategy was to turn on the diesel and keep things steady. A few more laps through the race I found myself back on Dillman’s wheel ready for a battle. As tenacious as Dillman is, I attempted several times to distance myself from him with no success. Near the end of the race as we both were running on fumes, I mustered just a bit more power to gain a second or two again in the bog and that was it. 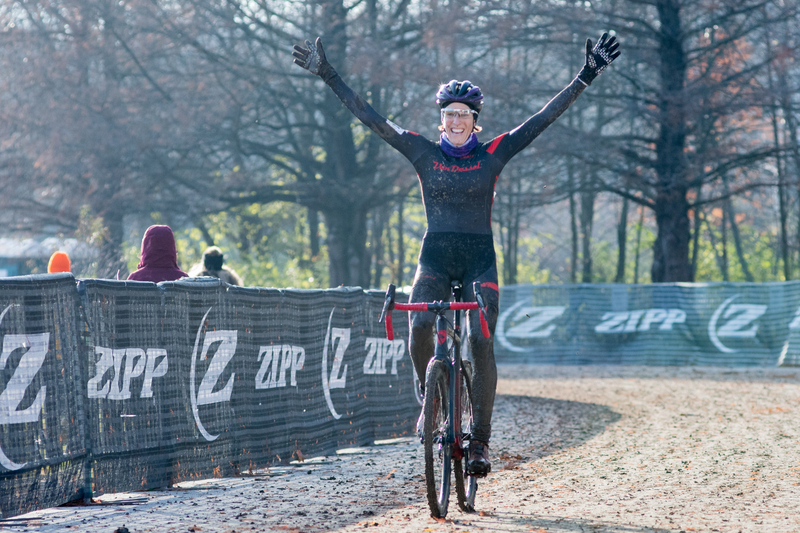 Riding the last lap alone, I kept things smooth to lock in another podium on the weekend. These were pretty much the busiest pits I have seen this year: constantly-running mechanics, pressure washers, hanger replacements and even mid-race brake pad replacements. Shortly after taking this shot Dylan Postier (foreground) was out of the race and spectating. I was pretty wrapped up in the shots I was getting but he said to me something like, “Gage is cooked. Michael is making up a lot time. He can win this.” I thought maybe he had a little “cross brain” going because to me Hecht looked like he was cruising to another dominant victory. Dylan’s description of that last lap is below. 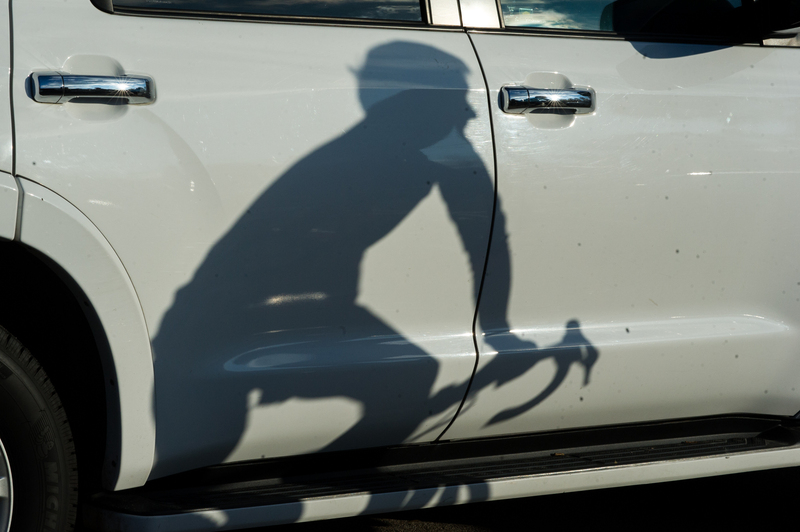 “I saw Michael come through the finish line on the last lap and was quite a ways down. I communicated to him that anything can happen and to keep pushing. A few seconds later I looked over to see Gage slogging through the mud and I could tell he was in a bit of trouble. I relayed the info again that he was down over 20 seconds but he realistically could win the race. “By this time, I was on the backside of the course so I had a good quarter mile to get back to where I could see the infield slog. As I was getting closer it looked like Michael was in front but I couldn’t tell if they were in the same lane at that point. The next thing I heard was the announcer shouting that Michael had taken the lead and had a good gap.